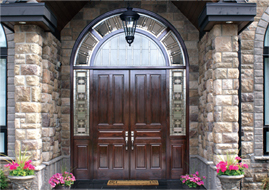 Exterior Doors Edmonton | Fancy Doors & Mouldings Ltd.
Our company has some of the fanciest exterior doors in Edmonton! Our exterior doors will keep your Edmonton home and your family warm in during our long, harsh winter. With the large selection and variety of styles on display at our showroom in Edmonton your exterior doors are sure to make a great impression and be the envy of the neighbourhood. 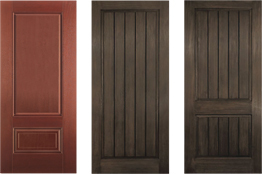 We are proud to say that we have the biggest showroom for exterior doors in Edmonton, and all of Alberta. You are guaranteed to find something that will capture your fancy. The exterior doors found in our Edmonton showroom are cost-effective, safe and provide protection against the elements. All FD+M metal doors are exceptionally durable and provide your home with safety, security and protection against the elements. Exterior metal doors come in a wide variety of designs, and can be upgraded with decorative glass inserts. Fancy Doors also carries the popular mini-blind door to allow in natural light, while allowing for exceptional privacy control. Pet owners will be interested in our pet panel upgrade, so your pets can wander in and out to their little hearts content. Fibreglass doors look great, and are built to a high quality standard too! Traditional wood products may crack, split or peel after years of use; Fibreglass doors are designed to repel all types of weather. FD+M Fibreglass doors are engineered for the Canadian climate, be it the sharp cold of an early February morning, or the arid heat of a July summer noon. Fibreglass exterior doors come in many prefabricated designs and textures. They also come primed and ready for our customers to finish just the way they like as well. Fibreglass doors are an energy efficient upgrade for any home. With options like wrought iron inlays, metal grills and dental shelves, they not only raise your home’s curb appeal, but will elevate the sense of pride you feel about it. At their most basic, doors are a slab of wood with some hardware. They can be so much more than that. Fancy Doors knows how to take a door to the next level with brilliant transoms, artisan crafted glass sidelights, optional medieval add-ons, double doored entrances, natural wood doors, all finished right to ensure longevity. Be breathtaking, your front door is your first impression. Make it impressive, make it inspiring, and make your front entrance, a Fancy one. Throughout history, humanity has striven to build beautifully. Architects, master builders, and artisans, all have tried to push the envelope with bold new designs. FD+M offer Modern Doors for home owners desiring a contemporary, forward look. Add daring curves, or sharp angles depending on the door you chose for your home. 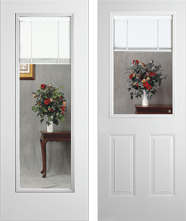 When you choose Fancy Doors you get a modern, stylish, designer door, available in either solo or double door varieties.